Private Walter Hutchinson lived through the Battle of the Somme, surviving to tell his story of some of the bloodiest fighting on the Western Front of the first world war. The first Battle of the Somme saw some of the worst fighting of the first world war. There were more than one million casualties. the British suffered 57,470 casualties, including 19,240 dead, on the first day alone – making it the bloodiest in our history. 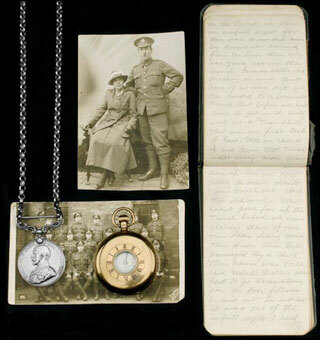 Private Walter Hutchinson, a stretcher-bearer in the 10th Battalion, York & Lancaster Regiment, kept a diary for the first few weeks of the campaign. He eventually returned to civilian life as a grocer, living on into the 1980s. 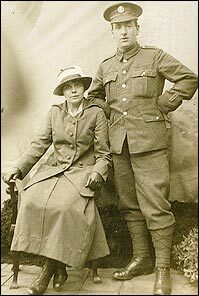 He is pictured here with his wife, Evelyn. Hutchinson’s diary came to light after his death, and was sold at auction in 2007 for £7,360. It gives a blunt and vivid account of the horrors of trench warfare. Extracts from the diary of Private Walter Hutchinson from the first four days of the Battle of the Somme, 1-4 July 1916. On Saturday July 1st we set off for the trenches about 10 o’clock. As soon as we got on the road we saw an awful sight for there was wounded men by hundreds coming from the line. When we was going across the marsh, German shells was dropping all round but none of us was hit. We then landed to a communication trench. But before we had time to get in it Fritz sent us a tear shell. That was our first taste of gas. Well we raced up and down that trench until every man was done up for we kept getting the orders about turn, double out, and then advance. We hadn’t gone far up the trench before we came across three of our own lads lying dead. Their heads been badly damaged by a shell. Their names were Voice and Webster Brothers. We had to go scrambling over the poor fellows – in and out, in and out. It was one of the awful sights I had ever witnessed and at this point our own lads was coming out wounded as we was following them in. Then the order came down dump everything and fix bayonets you have got to fight for it lads. We obeyed the order like men. And was soon out of the trench and going across the open. I was running across a trench when the grid broke and let me through. I scrambled out and ran after the other boys. But had not gone far before I was hit on the hip with a piece of shell. But I was still like Charleys Aunt, I kept running after the boys. We then landed at the trench we was making for and found out it was our own original front line trench. And we saw some awful sights in it for a lot wounded men that not been got out then. I was put with a few more men to guard a communication trench by Corpl Avely who afterwards got wounded. And nobody seemed to know anything about us. At night some more men came into that trench so we set off to find our own Coy. But could not find them anywhere, so we got into a dugout and stayed there the night. I know we had had a lot of lads wounded and I had not seen anything of Charley my pal since we crossed the open in the morning. On Sunday morning July 2nd I was looking out of the little dug out when I saw one of our officers coming up. I told him we was stranded from the Coy and he took us back to the Coys again. When I landed to the lads I asked about my pal and they told me they was afraid he had been killed. But I went and lifted the oilsheet from over his face and found that it was Harold Beecher. And I asked questions about him and found out he was badly wounded Saturday night and died early on Sunday morning. He was a clerk in civil life. I was very sorry for we had been good chums from the day we arrived in France . We then was moved to another post and before we had been there long four of the lads got buried. But pleased to say there was no one hurt. We then sent for the officer for it was getting very warm and the officer Mr Cattle came and sat with us until we moved to the extreme Left. It was about 8 o’clock on the Sunday night when we arrived on the Left and soon after I met Charley for the first time since Saturday when we crossed the open. A little while after I saw another of our lads killed with a shell called Bill Hall. He came from Rawmarsh. We was having a very hot time, the bombardment had never ceased a minute since the Sat morning. It was at this place that I found out that Len Potts had gone off with shell shock. He had got it very bad. We had it very hot all the night and had some more casualties. On Monday July 3rd we was still getting it very warm and during the morning our Sergent Steel got killed and another of our pals got badly wounded. They called him Hinchliffe. Hinchliffe was wounded in the arm and head and both Ruddles and him got wounded in both legs. One been very bad. Things seemed to quieten down a bit about teatime so we got to work and dug some graves and buried our poor comrades. We buried the poor fellows as respectful as we could under the circumstances. After that I was on sentry and I thought I saw something like a dead body on the wire just in front of our trenches. I called the officers attention to it and Mr Cattle and another officer went over the top but found it was only a heap of bags. We was then patiently waiting of been relived. While we was waiting another officer ran up and wanted a drink of water. I gave him my bottle and after he had regained his breath he told us that the officer Mr Goodall had got wounded and a stretcher was sent down. Soon after that we got relieved and we marched back to A..loy Wood. It started raining and it was glorious. On July 4th Tuesday we stayed in A…. Wood and soon made some tea and had something to eat for the first time since Saturday morning. It rained all day but we had to make the best of it. We got wet through and at night we went on a working party and was up to the waist in water. But we had a very good officer with us – Mr Cattle. We returned to the wood about 3/30am and made a fire and stood round until our clothes dried. We then got to rest and slept until dinnertime. Just after dinner Fritz started shelling us again and at 6 o/c we was moved back up the Line to some reserve trenches. We was fairly quiet from the Wednes. to the Friday teatime, then Fritz started shelling us again. I was talking to these three men some 10 yards away and a shell dropped and killed all the three of them. It was an awful sight. I then went and reported the matter to the officers and they came at once to the scene. We then got the poor fellows buried which was a very difficult task for shells was dropping all round us. We then kept very low in the trenches until 9 o/c, then I went with some other men to fetch the rations up. And the shells was so vivid that we got split up and only 5 of us landed to the ration dump. We bought back what we could and left the others and we was so long as they sent a search party out to find us. But they met us before they had got very far and we went back all together and all safe. We then got down for the night but about 2/30 am we got the orders to crawl down the trenches as Fritz was blowing up the trenches all to bits. We got down the trench alright which was about 100 yards in length and we had to stay there until 6 o’clock on Saturday morning before we could get into the trench that led us out. We then went to North Bluff dugouts and stayed there until 8 o’clock on Saturday night. We then set off and marched to… Wood as we could no longer stay in the Line as our casualties had been so heavy. Source: Pocket diary of Private Walter Hutchinson, sold at Dix Noonan Webb auctioneers, March 2007.